We frequently add recipes to our web site. Check early in the month for new and interesting ideas, guidelines and recipes! Apples are in season and there are many varieties to choose from. Most of the orchards open to the public on the weekends and allow you to pick your own. I invite you to checkout our Cooking Tips Page, as I add new tips often as well as our Party Planning Tips, designed to keep everyone organized and calm. Mix salt, pepper, paprika, and herbs with 2 TBS olive oil and rub on the chicken. In large skillet, heat 3 TBS olive oil. Place chicken skin side down in oil. allow to cook on medium high heat for 5 minutes on each side. Remove chicken. Deglaze skillet with onions and garlic. Add chicken stock, tomato sauce, water, salt, pepper and bay leaf to pan. Add chicken and allow to simmer 15 minutes, covered. Add rice by pouring it slowly around the chicken into the liquid. Add frozen vegetables. Cover and let simmer on low heat for 20 minutes. Watch it carefully and turn off when the water evaporates. Add green pepper and Spanish olives on top. Cover and let sit 10 minutes. The steam will cook the peppers and keep them crunchy. To serve: Place rice on the platter and arrange chicken. Preheat oven to 375 and spray cookie sheet with cooking spray. This chicken recipe is easy and seasonal, and especially elegant and delicious as a very different holiday main course. Heat oil in skillet. Add cutlets, onions and carrots. Brown cutlets 5-6 minutes on each side until tender and cooked through. Remove chicken from pan. Add chicken broth to deglaze skillet. Add chicken back to skillet and simmer 15 minutes, covered. Remove chicken and vegetables and place on serving platter. Reserve 1/3 C cooking liquid. Add cooking liquid to skillet and stir in pomegranate juice. vinegar, brown sugar, salt, oregano, basil and cornstarch. Reserve a few pomegranate seeds for garnish and add the rest to the skillet. Bring to a boil over medium heat and simmer 3-4 minutes. Drizzle the sauce over the chicken. Garnish with seeds. This pepper steak gets its kick from the scotch. I like serving it because it is a meal in itself. Marinade pepper steak in soy sauce, oil, garlic, ginger and scallions for one hour. Spray large skillet with cooking spray and heat on high flame. Add pepper steak with marinade and brown until cooked. Remove pepper steak. Add scotch to deglaze pan. Add sugar, sesame oil, onions and peppers and saute quickly. Add the pepper steak and heat thoroughly, mixing well. Add beef broth with corn starch. 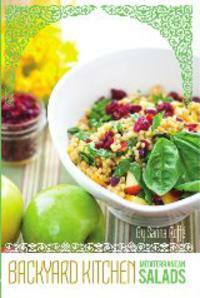 I like this recipe for its simplicity, good flavor and health cooking. Using heirloom tomatoes adds nice color. If heirloom tomatoes are not available, use ripe red tomatoes. The herb pesto can be made in advance. In skillet, add 1/2 inch water and simmer. Add olive oil and lemon juice. Gently add fish a few at a time, poaching for 2 minutes. Sprinkle with salt and pepper. Gently turn and poach the other side. Remove fish and place on towel to absorb water. Make herb pesto sauce: Place capers, basil, shallots, parsley, olives, and thyme in bowl. Add olive oil, salt and pepper and mix well. Arrange tomatoes on platter (or you can do individual plates). Sprinkle with sea salt. Gently arrange fish on top. Drizzle on the the herb pesto sauce. Spray cooking pan with cooking spray. Place potatoes in large pot. Cover with water. Bring to a boil and simmer 10 minutes until fork tender. Reserve 1 C of the liquid. Drain. Place potatoes back in pot. Mash with potato masher and mix in 4 TBS butter, salt, pepper and pesto. Unroll phyllo dough. One sheet at a time, place on clean surface. Brush with butter. Place second sheet on top of the first. Repeat until you have six sheets stacked and buttered. Work quickly so the phyllo doesn’t dry out. Place one fourth of the potatoes along the long edge of the phyllo dough. Roll tightly into a long log. Brush top and bottom with butter. Place on lined cookie sheet. Repeat and you will have four long logs. Using a serrated knife, score the logs at one inch intervals on a diagonal. Do not cut all the way through. The herb potatoes may be frozen at this point. To cook: Bake logs on lined cookie sheet for 20-30 minutes at 375 degrees. Slice through and serve warm. Put lentils, scallions, parsley, kerbies, and tomatoes in bowl. Mix remaining ingredients together. Pour over salad. Peel carrots, leaving one inch of the green on top. In skillet, heat olive oil and water. Add carrots and simmer. Let the liquid evaporate and you will see the carrots obtain a nice glaze. Pour juice, strawberries, peaches, ice, honey and mint into food processor. Puree and refrigerate until ready to serve. Pour into wine glasses and fill half way. Add a scoop of sorbet. Fill glass with seltzer. This adds fizz. Preheat oven to 350 degrees. Grease 9 x 13 inch cake pan or bundt pan by spraying with cooking spreay and coating with flour. In mixing bowl of mixer, beat eggs and honey together Add sugar and mix again. Mix coffee with baking powder. Add to egg mixture with margarine and mix again. Sift baking soda, flour and cinnamon together. The sifting lightens the cake. Add slowly to egg mixture, beating well after each addition. Pour into baking pan and bake one hour or until toothpick comes out clean. Cool completely and turn onto serving plate. Mix orange juice with confectioners sugar and zest. You may need to add a few drops more orange juice. Do not add too much. You want a smooth consistency, not too loose. Pour onto honey cake and allow to drizzle over sides. Any honey cake can be used to make this Honey Cake with Orange Mousse, even store bought. If you make your own, then simply add 1 tablespoon of orange zest to your recipe. Divide ripe into 2 inch 9 inch round or square pans. If using store bought Honey Cake loaves, you will need two, cut in half through the middle to make four long flat pieces of cake. The goal is to have two layers and place the Orange Mousse in between and on top and to either have a square cake or a round cake at the end. 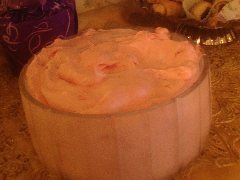 The curd for the orange mousse can me made 12 days in advance. Place sugar, eggs, yolks, zest and juices in double boiler. Whisk to combine. Set over medium heat with simmering water (it should not touch the bottom of the double boiler). Cook uncovered, whisking occasionally until thick, about 20 minutes. Remove from heat and add 1 TBS at a time of margarine. Cool and then cover with plastic wrap and refrigerate overnight (or 1-2 days). When ready to assemble cake, whip cream and fold into the orange curd, a little at a time. To make sure cake is flat, trim sides and tops so it is flat. Place cake on serving platter. Place pieces of wax paper around the edges, just under the cake. Top with more mousse, spreading evenly to the edges. Cover with second layer. Top with mousse, spreading a thin layer evenly on the sides. It is ok if you don't cover the cake completely. At this point, you should have used half of the mousse. Freeze for 30 minutes. Add another layer of mousse, covering sides. Freeze for 30 minutes. Using remaining mousse, add a final layer, using a spatula to smooth all sides. Garnish with toasted almonds and serve with Pomegranate Sauce. Place all ingredients in saucepan, reserve a few pomegranate seeds for garnish. Bring to a boil over medium heat and simmer 3-4 minutes. When serving the cake, drizzle the sauce over the cake. Garnish with seeds. I love this tart because it is elegant and easy. You can use any fruit, but I chose apples since they are traditional for Rosh Hashanah and in season. Mix apples with brown sugar, cinnamon, lemon, and salt. Preheat oven to 400 degrees. Cover baking sheet with parchment paper. Spray with cooking spray. Open puff pastry and cut in half. Place on parchment paper. Place apples on puff pastry. Start at one thin end and line them up so the apples overlap. Repeat with enough apples until you get to the other end of the puff pastry. Repeat with the second puff pastry. Remove to serving platter. Before serving, heat caramel sauce and drizzle over tarts. Sprinkle with walnuts. 1. Using large bowl of electric mixer, beat 2 egg whites and a pinch of salt on high speed until stiff. 2. Gradually add ½ C sugar, beating constantly. 3. Slice one pint fresh strawberries. 4. Lower mixer speed to slow and gradually add strawberries to egg whites. Continue beating and gradually increase speed to high. (Be careful to do this slowly). 5. Beat for 10 minutes until mixture fills bowl. 6. Spoon into serving bowl. 7. Place in freezer over night. Serve frozen. Sarina’s Tip: For a classier presentation, use individual parfait glasses. Fill halfway, sprinkle with crumbled macaroons or cookies, fill the rest of the way, and top with a cherry. Freeze. Place tea, sugar, rind, and mint in bottom of teapot. Add water and let brew 10 minutes. Place 2 mint leaves in tea glass. Pour hot tea into tea glass and serve hot. Place all vegetables in salad bowl. Open pita loaves and cut into wedges (about 12 per loaf). Arrange on cookie sheet. Serve with avocado, guacamole, babaghaouj or humus. What could be more healthy than a fruit drink for breakfast! Heart healthy pomegranate juice is the secret and essential ingredient. Place cut mango in the bottom of a pitcher with 2 C crushed ice. Mix well and pour into cocktail glasses. In a small bowl mix the rub ingredients – salt, pepper, paprika, oregano, thyme, lemon zest and olive oil. Season the chicken inside and out with the rub. Tuck the tips of the wings behind the chicken’s back. Open the beer can and pour out about half the beer. Put the rosemary, garlic, lemon juice, thyme, mint, and red pepper flakes into the beer can (so they will flavor the steam). Make 2 more holes in the top of the can with a can opener. Place the beer can on a solid surface. Plunk the chicken cavity over the beer can. 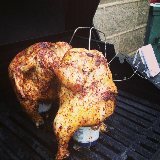 Transfer the bird-on-a-can to the grill, balancing the bird on its two legs and the can, like a tripod. Grill over indirect medium heat, with the lid closed, until the juices run clear and the internal temperature registers 170°F in the thickest part of the thigh (not touching the bone). Grill for 75 to 90 minutes. Carefully remove the chicken and can from the grill (do not spill contents of beer can, as it will be very hot), and let rest for 5 to 10 minutes (the internal temperature will rise 5 to 10 degrees during this time). Lift the chicken from the beer can and cut into serving pieces. Serve warm. Roll bread dough into 2 inch balls. Roll dough in melted butter, then the cinnamon and sugar mixture. Arrange balls in tube pan. Add raisins and/or nuts if desired by sprinkling between layers. Bake 45 minutes or until golden on top. Place basil leaves, garlic and nuts in food processor. Process until fine, slowly add olive oil through spout, keeping the machine on. If using parmesan, add now. To use with pasta, add a few tablespoons pesto to pasta with 1/4 C pasta water. Store remainder in a jar in the refrigerator until ready to use. Mix, cream cheese, butter, egg yolk, sugar, flour until smooth. Divide dough into 5 or 6 balls. Flatten balls and place on plate in refrigerator overnight. Cover with wax paper. Using cinnamon mixture, dip one ball at a time in mixture, covering all sides. Spread some cinnamon and sugar on a flattened surface. Roll dough on this surface in thin circle. Brush with egg white. Cut into eight or twelve wedges. Place spoonfuls of nuts and raisins along edge of circle. Roll each wedge from outer edge towards the center, rolling tightly as you go. Roll the wedge in cinnamon and sugar and bend slightly into crescent shape. Place on ungreased tray for baking. Bake in a preheated 350 degree oven for 25 minutes or until slightly golden brown. Place herbs, garlic and shallots in food processor. A Syrian specialty, Be'id Uh Fronge (Tomatoes and Eggs) this recipe was really a poor man’s food. Easy to prepare, vegetarian and absolutely delicious! This was a favorite for a light Saturday evening meals, after Shabbat, when light fare is favorable. Heat oil in 3 qt saucepan and sauté onion and garlic. Add green pepper and sauté two more minutes. Add tomatoes with juices and break up into pieces. Add salt and pepper and simmer for 20 minutes. Raise gas to high and break eggs into pot (whole, not scrambled). Mix gently with spoon, breaking up egg whites as they cook, but leaving the yolk intact. It should appear that the egg whites are stringy throughout the dish. Cook 10 minutes, until egg whites turn white and mix well into tomatoes. Serve in bowl with hot pita bread. Add the stock and kosher salt and bring to a boil. Stir in the couscous, reduce heat to medium and cook for 7-10 minutes until the water evaporates. Turn off flame. Let stand 10 minutes. In a bowl, mix together olive oil, lemon, salt, pepper, parsley, mint, and basil. Add tomato, red pepper, and pine nuts. Stir in couscous. Garnish with lemon slices. Serve warm or chilled. Prepare and bake cake according to pkg directions in 9 x 13 inch pan. Cool. Slice strawberries in half and place on frosting in lines to make the stripes of the American flag. This recipe was a favorite on weekday afternoons when Reneé and her sisters and friends would gather at her home for afternoon coffee. Reneé usually doubled the recipe to make a very high cake and Reneé was known for this cake which has become a favorite in our house as well. Grease and flour tube pan. Preheat oven to 325 ¢ª Fahrenheit. Cream butter, add sugar and salt and mix well in electric mixer. Add 1 egg at a time, sour cream, and vanilla. Mix well. Add flour, baking soda and baking powder, mixing until thoroughly blended. Add nuts. Pour half of batter into pan, spreading evenly. Add half of the cinnamon mixture, sprinkling a thick layer on top of batter. Repeat with remaining batter and cinnamon mixture. Knife through the batter to make a cinnamon swirl. Place egg whites and sugar in double boiler. Whisk until the sugar is absorbed. Remove and cool. In food processor, whip ricotts and cocoa together. Beat egg whites on high speed in mixer, until firm peaks form. Sprinkle with cocoa powder or crumbled cookies. 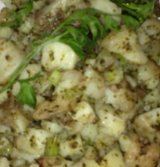 Use red new potatoes in this delectable potato dish. Place potatoes in a 3 qt saucepan and cover with water. Bring to a boil with 1 TBS kosher salt and simmer 10 minutes. Drain and set aside. In oven proof skillet, heat oil and saute onion and garlic until translucent. Lower heat and add potatoes, pepper, salt, pepper, thyme and parsley. Mix slightly and simmer, covered 10 minutes. These breakfast potatoes can be served as is. To make a fritata, whisk 6 eggs and pour over the potatoes. Simmer until set on low heat, about 10 minutes until edges look set. Place in 400 degree oven for 15 minutes to finish cooking. Remove from oven. To serve, loosen sides. Place a dish on top of the skillet and turn over. Serve in wedges. Garnish with parley. In 3 qt saucepan, melt butter and margarine together on low heat. Saute onion and garlic until translucent. Add flour, salt and pepper and continue cooking to make roux. Separately, place florets and salt in pot, cover with water and bring to a boil for 10 minutes. Drain and cool. Add cold milk to roux and mix thoroughly. Add warm stock and mix again. Chop broccoli into small pieces and add to soup. Grate potatoes and onion using a box grater, or use the grater attachment to the food processor. By handfuls, squeeze the potatoes to remove excess water. Do this over a sink. Add salt, pepper, matza meal, 2 egg and parsley if using. Mix well. Add third egg if needed. Mix should not be too loose. In skillet, heat 4 TBS oil. Using a spoon, drop potato mixture into oil. Flatten slightly. When edges are brown, flip to fry the other side. Drain on paper towels or brown paper. Continue until all are fried. Serve warm with apple sauce.